Today, two surprising and terrifying events occurred on two different sides of the world. As shown in the following video, thin and sticky white spider webs appeared overnight on buildings and vehicles across north Texas. They represent a migratory method used by a certain variety of spiders. Do not worry, they are not dangerous. 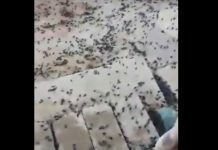 Last year, spiders were also responsible for this apocalyptic scenery in Brazil. The following video presents the terrifying hornets from Japan. These insects are aggressive and terribly scary. The insects’ highly toxic stings can lead to anaphylactic shock and renal failure. But what are giant hornets? 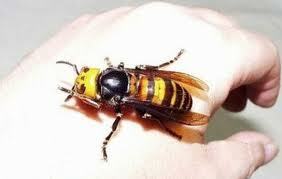 The Asian Giant Hornet (Vespa mandarinia) is the world’s largest and the most dangerous animal in Japan. 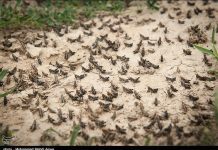 These insects are called suzumebachi (sparrow bee) in Japanese and are a common sight during summer months from the high mountains to the forested edges of large cities throughout the country. 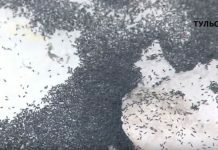 The insects make their living hunting other insects and specialize in attacking honeybee colonies where they will kill all of the bees and consume the larvae. The native honeybees of Japan, however, are not without defense as they will sometimes ambush en-mass an intruding suzumebachi, covering the hornet with their own bodies. This causes the body temperature of the wasp and bees to rise, killing the wasp which has a lower maximum temperature tolerance than the bees. Imported commercial honeybees have no such defense and are easy victims to suzumebachi in Japan and other parts of Asia.